Sababa. 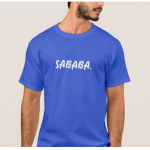 Sababa by Humans of Judaism Men’s Tee Blue and white, Israel. Hebrew.